A very long tail (over 4 light years across) may be stretching away from a spinning neutron star, or pulsar. The pulsar, named PSR J0357+3205, is located about 1,600 light years from Earth. The tail is puzzling because it shares characteristics with other tails extending from pulsars, but differs in certain properties. Astronomers hope obtaining more data with Chandra and other telescopes will clarify the situation. A spinning neutron star is tied to a mysterious tail - or so it seems. Astronomers using NASA's Chandra X-ray Observatory have found that this pulsar, known as PSR J0357+3205 (or PSR J0357 for short), apparently has a long, X-ray bright tail streaming away from it. This composite image shows Chandra data in blue and Digitized Sky Survey data in yellow. The position of the pulsar at the upper right end of the tail is seen by mousing over the image. The two bright sources lying near the lower left end of the tail are both thought to be unrelated background objects located outside our galaxy. 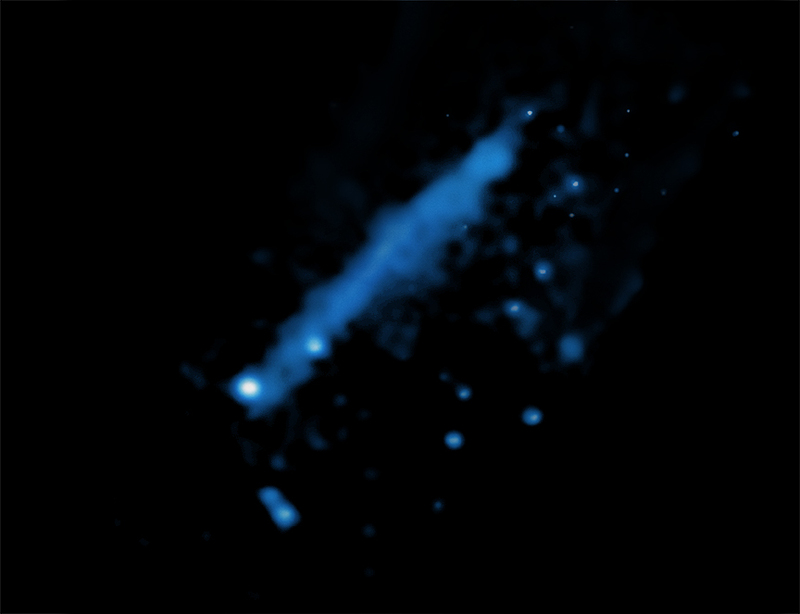 PSR J0357 was originally discovered by the Fermi Gamma Ray Space Telescope in 2009. Astronomers calculate that the pulsar lies about 1,600 light years from Earth and is about half a million years old, which makes it roughly middle-aged for this type of object. The Chandra data indicate that the X-ray tail may be produced by emission from energetic particles in a pulsar wind, with the particles produced by the pulsar spiraling around magnetic field lines. Other X- ray tails around pulsars have been interpreted as bow-shocks generated by the supersonic motion of pulsars through space, with the wind trailing behind as its particles are swept back by the pulsar's interaction with the interstellar gas it encounters. However, this bow-shock interpretation may or may not be correct for PSR J0357, with several issues that need to be explained. For example, the Fermi data show that PSR J0357 is losing a very small amount of energy as its spin slows down with time. This energy loss is important, because it is converted into radiation and powering a particle wind from the pulsar. This places limits on the amount of energy that particles in the wind can attain, and so might not account for the quantity of X-rays seen by Chandra in the tail. Another challenge to this explanation is that other pulsars with bow- shocks show bright X-ray emission surrounding the pulsar, and this is not seen for PSR J0357. Also, the brightest portion of the tail is well away from the pulsar and this differs from what has been seen for other pulsars with bow-shocks. Further observations with Chandra could help test this bow-shock interpretation. If the pulsar is seen moving in the opposite direction from that of the tail, this would support the bow-shock idea. These results were published in the June 1st, 2011 issue of The Astrophysical Journal. The first author is Andrea De Luca of Institute of Advanced Study in Pavia, Italy (IUSS), the National Institute of Nuclear Physics (INFN) in Rome, and the National Institute for Astrophysics (INAF) in Milano. The co-authors are M. Marelli of INAF, Milano and the University of Insubria in Italy; R. Mignani of University College London, UK and University of Zielona Gora, Poland; P. Caraveo of INAF, Milano; W. Hummel of ESO, Germany; S. Collins and A. Shearer of National University of Ireland; P. Saz Parkinson of University of California at Santa Cruz; A. Belfiore of University of California at Santa Cruz and University of Pavia; and, G. Bignami of IUSS, Pavia and INAF, Milano. Coordinates (J2000) RA 03h 57m 52.61s | Dec +32° 05´ 12.38"
Wow, thanks for the imformation, good job, thanks again. Aaaaah! another fascinating mystery! Interesting article also. Hi, I think Such an observation will examine many alternative theories of gravity, a promising theory is needed. I agree with (1). Also, I agree with the Big Bang hypothesis & am a believer in relativistic gravity. I wonder what could be responsible for decreasing the rotation of the pulsar - or any heavenly body. Such an observation will examine many alternative theories of gravity, a promising theory is needed. A pulsar (or spinning neutron star) located about 1,600 light years from Earth. About 1630 light years from Earth. X-ray data from Chandra, and Optical data from DSS. About 8.5 light years across. X-rays are blue and optical data are yellow. In the constellation Perseus, visible from Northern Hemisphere.